This past weekend was possibly the worst for residents in the Washington Metropolitan area. Friday night’s thunderstorm left close to a million without power in one of the hottest weekends of the summer. This week, there are still as many as 400,000 in the District and parts of Maryland without power. Representatives from PEPCO say that total restoration of power can take as long as the end of this week. For many residents, a week means heat – related illness, spoiled food, restlessness, and hot tempers. What is the perhaps the saddest part of this turn of events is that this is not the first time PEPCO has been slow to rescue its customers in their time of need. Snowmaggedon 2010 still serves as one of the best and most memorable examples. PEPCO’s timidity prompted public outrage which in turn led to a five – year reliability enhancement plan. This plan was created to hold PEPCO accountable and update its system to help customers more efficiently. enhanced tree trimming to improve clearance between overhead electric wires and tree branches. installing smart control systems that allow the electric system to quickly identify faults. hardening the high – voltage supply lines to reduce the number of tree related damages. Response problems are symptoms of a system that has been deteriorating since 2005. The past weekend’s events have shown that even with an improvement plan, PEPCO still has a long way to go. While it has blamed trees for outages, research shows that electric companies in cities with higher tree densities outperform PEPCO in reliability. Underground cable replacement in the District is a noble goal,but let’s not forget that the absence of underground cable has been the dealbreaker for residents living on the outskirts of the metropolitan area. Service this weekend was much worse for Maryland residents, 80% of whom get power from above – ground electrical lines, compared to the District’s one – third. Even with its promises of “smart systems” that identify faults in the electric system, the number of customers without power have fluctuated throughout the weekend and into the beginning of the work week. Only one -fifth of 200 workers requested by the president of PEPCO came and assisted in returning lights to residents. All came from Florida, Georgia, Maine, and New Brunswick, Canada. Major Take – Away from This Weekend’s Events – Infrastructure is obviously a major policy issue that deserves ample attention. It’s time to evaluate the effectiveness of PEPCO’s Five Year Reliability Enhancement Program. As the primary source of power for millions, its time that this company proactively works towards providing its customers with quality service when it matters the most. Timely service during natural disasters are what paying customers deserve and should get. 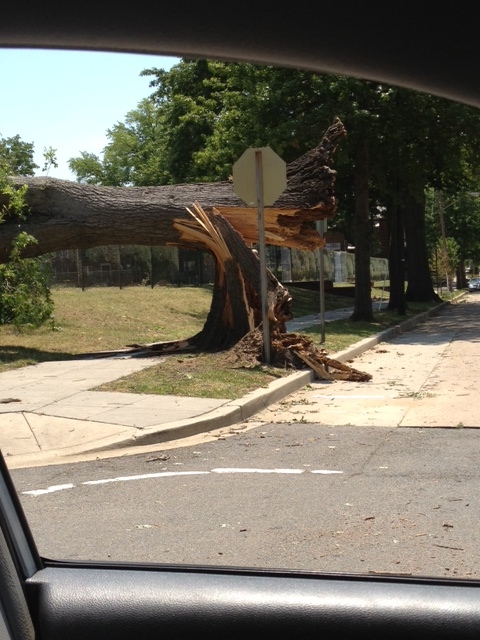 PEPCO will have a lot to explain if it takes until Friday to totally restore power. Bravo & well said. What a mess.